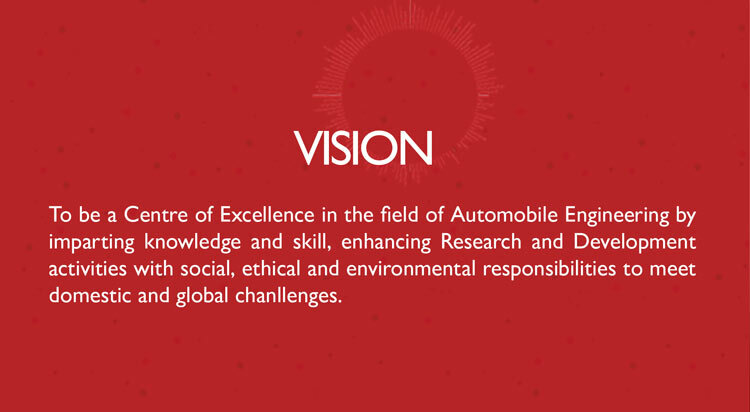 The Department of Automobile Engineering was started in the year 2007 with UG programme and Post Graduate Programme in Automobile Engineering with specialization in Electric and Hybrid Vehicles / Powertrain Engineering in collaboration with Automotive Research Association of India (ARAI), Pune. The department has been accredited by National Board of Accreditation (NBA) up to 2021. With the support of leading automotive industry, “WABCO” – a Centre of Excellence in automotive brake system was established in 2017. 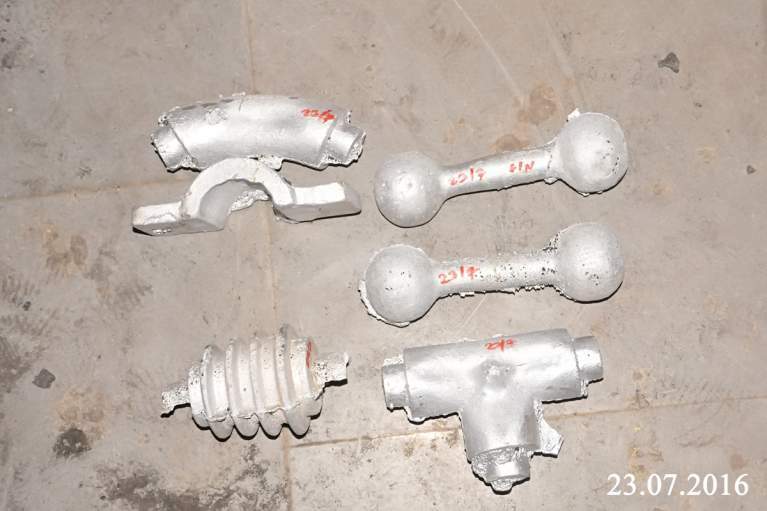 The department has established Research oriented laboratories such as “Engine testing lab” with the support of reputed automotive organizations such as ARAI, Ashok Leyland, TAFE and Greaves cotton Ltd, Computerized wheel alignment test facility which is rare in Indian Institutions. 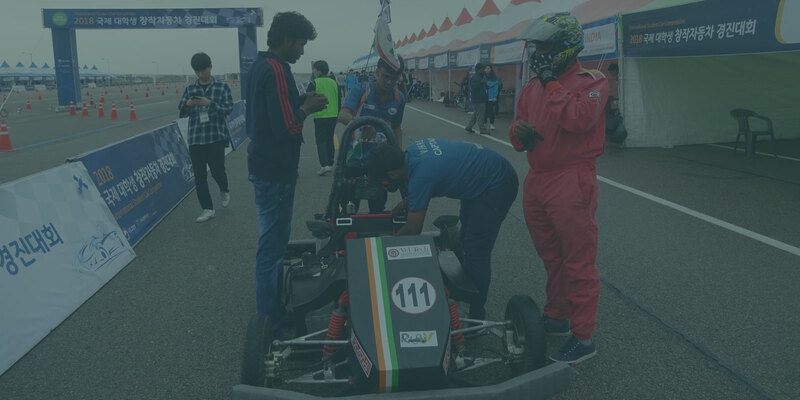 Our students have participated and won awards and prizes in events such as SAE-Supra, SAE- BAJA, e-BAJA and SAE tier I & II Electric Vehicle events, organized by SAE-India. 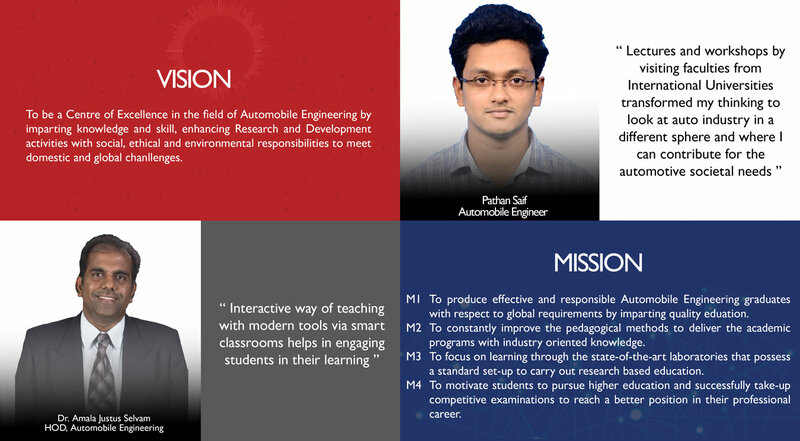 Our students regularly participate in “International Student Green Car Competition” organized by the Korea Automobile Testing & Research Institute, South Korea from the year 2015 and won “Creative Technology Award”, “Outstanding team award” and “Best of Best Creative Technology Award” in the year 2015, 2016 and 2018 respectively. The infrastructure and facilities of the department help students to develop the ability to identify, formulate and solve automobile engineering problems. 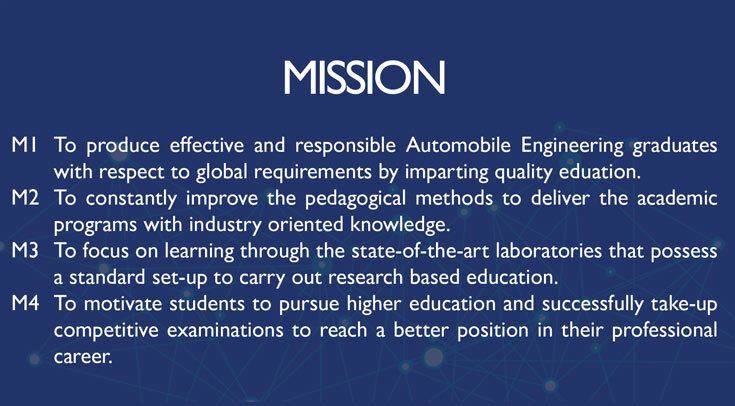 The laboratories are set up with the industry partners to help the students to enhance their technological skills, to conduct experiments, design and manufacture models as per auto industry speciation’s, which in intern acts a leverage for better placement in core industries. The students of the department are exposed to work with the Industries and Research Institutes from the date of joining the programme to cater the cutting edge technologies practiced by the Industries through the Industry Academia relation with TAFE, ARAI, WABCO, CIRT and many others. 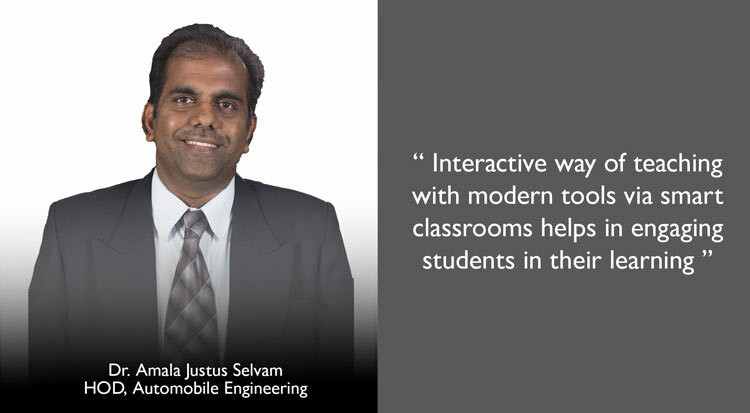 In addition to the class room teaching, the department brings the Industry experts to deliver the special lectures. The students are taking up internship opportunity at France & Germany. The department has well qualified faculty members from renowned Academic Institutes such as NITs, IITs and also from Industries background. The overseas agreement made by the department paves way for further studies with countries like USA, Taiwan, Germany, France. 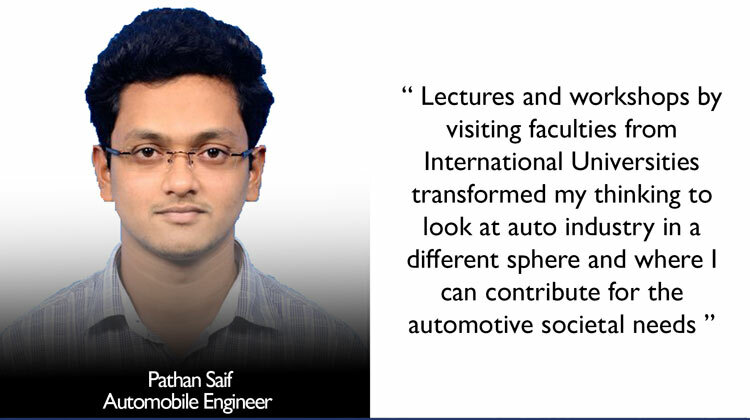 Graduates can excel in their professional career and higher studies with a strong foundation in automobile engineering. Graduates can design and develop any automotive system with their acquired knowledge on automotive design, manufacturing and familiarity with CAD/CAE. Graduates will have the capacity and willingness to become entrepreneur in the field of automobile engineering with a strong sense of responsibility to serve their profession and society in ethical manner. Graduates will exhibit strong communication and interpersonal skills, broad knowledge and an understanding of multicultural and global perspectives to work effectively in multidisciplinary teams, both as team members and as leaders. Automotive System Analysis and Testing: Identify, formulate and solve Automobile Engineering problems and to work in research laboratory and multidisciplinary tasks in Automobile Engineering.